Looking for an automated malware analysis software? Something like a 1-click solution that doesn’t require any installation or configuration…a platform that can scale up your research time… technology that can provide data-driven explanations… well, your search is over! 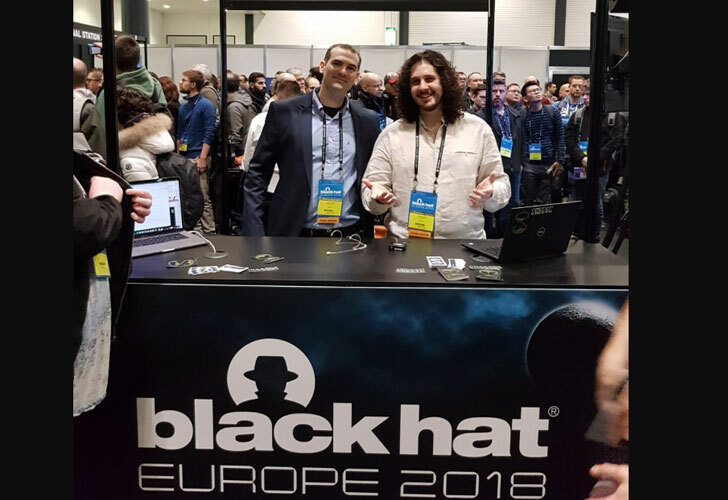 Israeli cybersecurity and malware researchers today at Black Hat conference launch a revolutionary machine learning and artificial intelligence-powered malware researcher platform that aims to help users identify unknown malware samples before they strike. 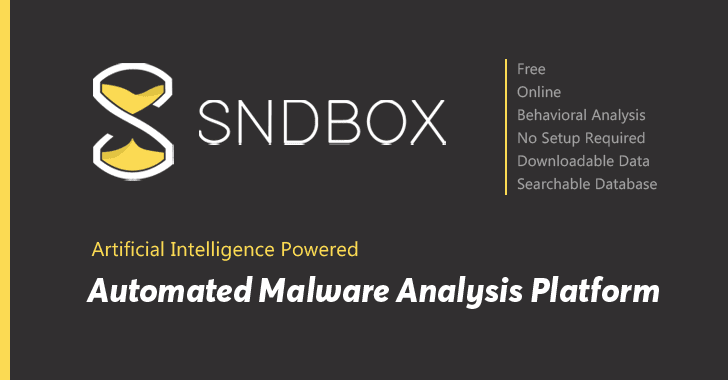 Dubbed SNDBOX, the free online automated malware analysis system allows anyone to upload a file and access its static, dynamic and network analysis in an easy-to-understand graphical interface. The loss due to malware attacks is reported to be more than $10 billion every year, and it’s increasing. Despite the significant improvement of cyber security mechanisms, malware is still a powerful and effective tool used by hackers to compromise systems because of its considerably improved evasion ability. In recent years, artificial intelligence and machine learning technologies have evolved tremendously and emerged as one of the most promising technique to detect never-seen-before malware by studying the behavior of various samples. However, since analyzing malware behavior is a post-attack technique that requires the execution of the malicious code at first place, the approach cannot be used as a defense mechanism; instead, you always need an isolated and controlled environment to monitor and examine its behavior. Developed by cybersecurity researchers Dr. Ran Dubin and Ariel Koren, SNDBOX makes the approach of behavior-based malware research more easier than ever before and accessible to everyone. What is SNDBOX and How Does It Work? 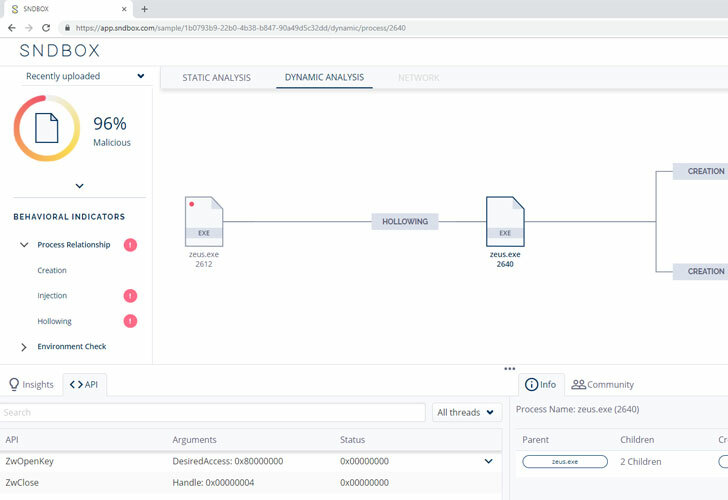 SNDBOX is a powerful, multi-vector, cloud-based AI technology platform that is not just capable of analyzing files against different attributes and vectors by monitoring their behavior, but it also converts dynamic behavioral inputs into searchable vectors, allowing users to search its vast online malware analysis database with excellent visibility. For efficient monitoring, SNDBOX executes submitted binaries in a controlled environment using an invisible kernel-mode agent, which deceives malware into believing that it is being executed in a real system it wants to attack. Located between the User mode and Kernel mode, SNDBOX’s invisible kernel-mode agent tricks malware into executing its full range of intended functionality, revealing its true malicious nature and capabilities. SNDBOX monitors executables behavior, ranging from simple modifications of system resources to advanced network activities, and then leverages machine learning algorithms to process a large amount of gathered data, which could be over 200MB for a small binary of 10KB, into easy-to-digest results. You might be wondering, what about computer viruses that wait for remote commands before activating their malicious payloads? “Even if it is waiting for a long period, we know how to gracefully trigger long sleep or events, making the malware execute its full potential of malicious code immediately by altering its behavior to receive maximum information regarding its true nature,” researchers told The Hacker News. The platform is designed in a way to automatically develop deeper knowledge and understanding on several aspects, behavioral patterns, vectors, attributes, classification, and signatures over time by investigating samples submitted to it. “Multi-vector AI detection mechanisms and behavioral indicators work together to detect malicious activity and aggregate data to provide decisive conclusions about the nature of the file,” researchers told The Hacker News. SNDBOX can also be integrated with a wide variety of 3rd party security platforms. How to Use SNDBOX Malware Analysis Platform? Available at https://app.sndbox.com, the SNDBOX platform can be accessed by just creating a free online account. After logging in, the dashboard offers users to either submit a sample for automated scanning or search the database for previously analyzed malware samples classified into different keywords and behavior tags. The analysis result dashboard has been beautifully designed to provide high visibility and data-driven explanations to scale malware research capabilities and reduce research time. The scoring system displays [top left] the final malicious score, in percentage, for an uploaded file, which it calculates after comparing results with previously analyzed data. The static analysis tab focuses on a complete analysis of malware without executing the malware. 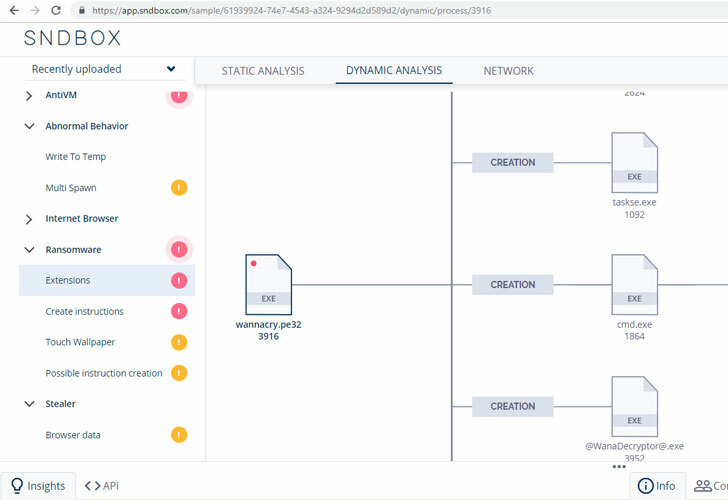 The Dynamic analysis tab displays the complete process tree that reveals the lateral movement happens on a target machine upon execution, for example, process hollowing, process creation, process injection, and so on. “We support all newest forms of lateral movement signatures (Including AtomBombing and ProcessDoppelganging, which are relatively new methods of ways to create processes and avoid antivirus detection),” the researchers say. Every part of the process tree is clickable, which reveals more information about each process under insight, API and info tabs. “For each behavior indicator we find, we provide the full pseudo code triggered this behavior. This is one way we provide huge visibility on what happened on the machine,” researchers told The Hacker News. Spora Ransomware, SNDBOX shows how it abuses Windows Management Instrumentation (WMI). Zeus Banking Malware, SNDBOX shows exciting information, such as visibility for “Hollowing,” and “Injection” lateral movement on the system. WannaCry Ransomware, highlighting its behavior of changing registry settings, using file encryption and creating files with different extensions. SNDBOX also intercepts network connections and DNS requests originating from the infected virtual machine while monitoring the submitted samples and displays results in the network analysis tab, revealing detailed information about source port, target IP address, target port, transport protocol service, duration, and timestamp. Besides this, the network section also reveals suspicious and strange activities based upon various signatures and vectors, like indicating if the malware uses Tor network for encrypted communication. Every malware sample submitted to SNDBOX platform using a free account and their results are publicly accessible through its powerful search feature. As I mentioned earlier, SNDBOX uses machine learning techniques to categorize and label analyzed malware samples based on extracted attributes, helping search feature to display relevant results more accurately. “Our reputation engine works alongside AI search to reduce false positives. Highly similar results are returned and scored based on their relevance,” the researchers said. It’s Publicly Available and Downloadable! Moreover, users can also view and download the full report for any submitted malware sample, its PCAP file (captured network traffic), as well as the sample file itself—even for files submitted by other free account users. 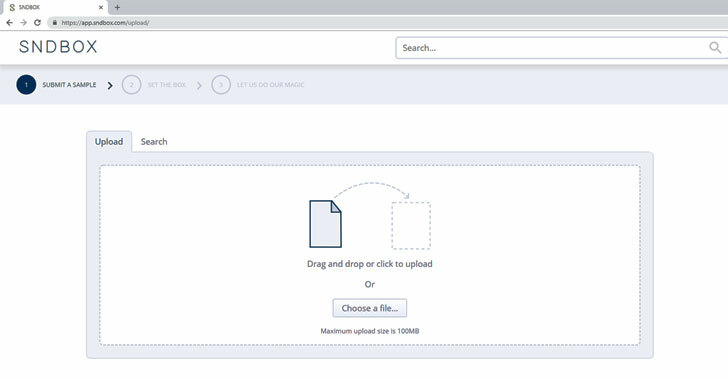 SNDBOX also offers premium accounts for private analysts and companies, allowing them to upload samples privately without sharing their results with anyone. “We also provide an on-premises version of our platform, where you can analyze your file in a completely off the network environment, on your organization, connect anything you want to the solution,” researchers said. What Security Researchers Have to Say About SNDBOX?